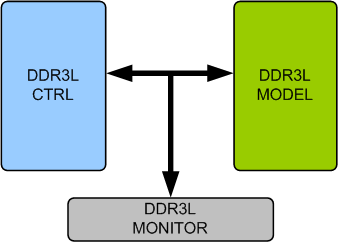 DDR3L Memory Model provides an smart way to verify the DDR3L component of a SOC or a ASIC. The SmartDV's DDR3L memory model is fully compliant with standard DDR3L Specification and provides the following features. Better than Denali Memory Models. Supports DDR3L memory devices from all leading vendors. Supports 100% of DDR3L protocol standard 8Gb_DDR3L.pdf. Supports all the DDR3L commands as per the specs. Supports up to 8 GB device density. Supports all speed grades as per specification. Quickly validates the implementation of the DDR3L standard 8Gb_DDR3L.pdf. Supports Programmable Write latency and Read latency. Supports On-the-fly for burst length. Supports Programmable burst lengths: 4,8. Supports the following burst order. Supports for All Mode register programming. Supports for Write data Mask. Supports for Power Down features. Supports for Output driver Calibration. Supports for automatic self refresh(ASR). Supports for self refresh mode. Supports for Self Refresh Temperature (SRT). Supports for Nominal and dynamic ODT (On-Die Termination) for data, strobe and mask signals. Supports for full-timing as well as behavioral versions in one model. Supports for all timing delay ranges in one model: min, typical and max. Protocol checker fully compliant with DDR3L Specification 8Gb_DDR3L.pdf. Models, detects and notifies the test bench of significant events such as transactions, warnings, and timing and protocol violations. Constantly monitors DDR3L behavior during simulation. Faster testbench development and more complete verification of DDR3L designs. SmartDV's DDR3L Verification env contains following. Complete regression suite containing all the DDR3L testcases.